First there was BumpyPhotos, where photos are “popped out” into a 3D relief. Then came the Cubify pics app that did something similar, but for free (and not creepy). The Mixee Me app from Shapeways then introduced customizable avatars that are just crazy cute. 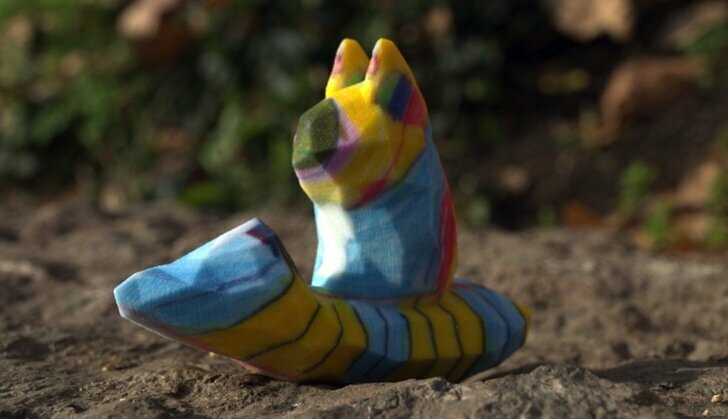 And now Shapeways has enabled another personalized, printed memento with Crayon Creatures. This service is for everyone, because coloring is for everyone, but children (well, their parents) are the target audience. Any kind of drawing or doodle can be easily uploaded to the site, and for 99 euros (~$130) plus shipping a full-color 4-inch sandstone figurine of the drawing will be shipped directly to you. Now your daughter’s drawing of you washing the dog on the moon doesn’t have to stay on the fridge; it can sit in 3D brilliance on the mantle or your office desk for all your coworkers to ask you about. Really, it’s its own advertisement, because once Susan in HR sees that you printed your daughter’s drawing, well she’ll just have to get little Jimmy’s printed too. It’s a tad expensive, but can you put a price on memories? The heartful masterpiece of your sweet child? Apparently: 99 euros (plus only 15 euros for international shipping).